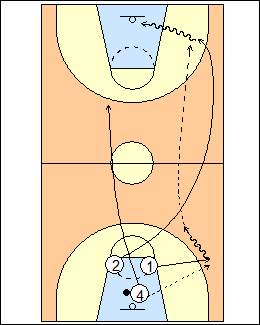 See YouTube video - Transition drills. - the rebounder is the rim runner. - go up and back twice (four trips). See Fast break - Izzo fly right, Continuous flow, 5 (post fly), 2 (headman), 2 (secondary), also 5star 2 on 0, Procopio 4 on 0 ballscreens, Shooting - DeMatha 4-corner jumpers, DeMatha transition, Tennessee 4-man break.